Our ongoing effort to reduce food waste in Iowa continues! 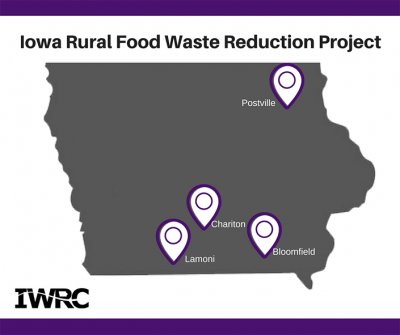 We’re pleased to announce the four communities selected to participate in the Iowa Rural Communities Food Waste Reduction Project. We discussed the unique opportunities available in each community with the project lead, Environmental Specialist and in-house food waste and composting expert, Jenny Trent. Settled near the southern border of Iowa, Lamoni houses Graceland University. With the goal of promoting food waste prevention and reduction in the community, the IWRC will work closely with the champion for Lamoni, the Sustainability Coordinator for Graceland University, Jen Abraham-White. Combining efforts with Abraham-White will “...provide both residents and business the opportunity to interact with a local expert as well as signing up to participate in food waste reduction efforts,” said Trent. “Bloomfield is a great community to work with and we have been warmly welcomed by everyone we've met there,” said Trent. “The people in Bloomfield have been so receptive to the project's goals to reduce and prevent food waste.” The IWRC will work alongside the citizens of Bloomfield and Chris Ball, the Energy Efficiency Director for Bloomfield for the project to help cut back on food waste in businesses and in households. Postville has been coined as the Hometown to the World and is located in Iowa’s northeast corner. “I really look forward to working with Mayor Leigh Rekow to promote food waste prevention and reduction initiatives on a community-wide basis and to meet the residents of this diverse community,” said Trent. The Postville community has a variety of businesses, schools, nonprofits and organizations that will remain a food waste reduction focus throughout the duration of the project. Chariton is located near the southern border of Iowa and Chad Masters from the Hy-Vee Distribution Center is the champion for the community. He has been instrumental in providing information about the community that will help reach residents as well as industries, commercial entities, and institutions to begin food waste reduction initiatives,” said Trent. Stay tuned for more information about the Iowa Rural Communities Food Waste Reduction Project!